That’s really lovely Gini. Such a kind gesture. Beautiful quilt. I too have made many new friends through the site, one who in particular lm sure will be a lifetime friend. I loved every minute of it! I’ve just gone in and bought the sunflower pattern as well! Thank you so much Gini for the kind review. I’m really glad you enjoyed it and thanks again for choosing to try curves without pins. Just love this design – from a distance the centre ‘blocks’ look like owls peeking out. Tempted to try one! 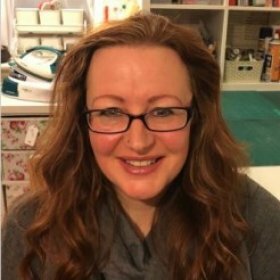 Another amazing pattern by Jenny and another ‘no pins’ convert for curves!!! Fantastic fabrics! I’ve made a couple of quilts using African prints, they’re very easy to get hold of in London although most seem to be imported from the Netherlands. I’ll take a look at the website, it sounds intriguing. Another really nice blog Sue. Your writing is always so interesting. Love all the versions Gini – well done. Will def have a go…. 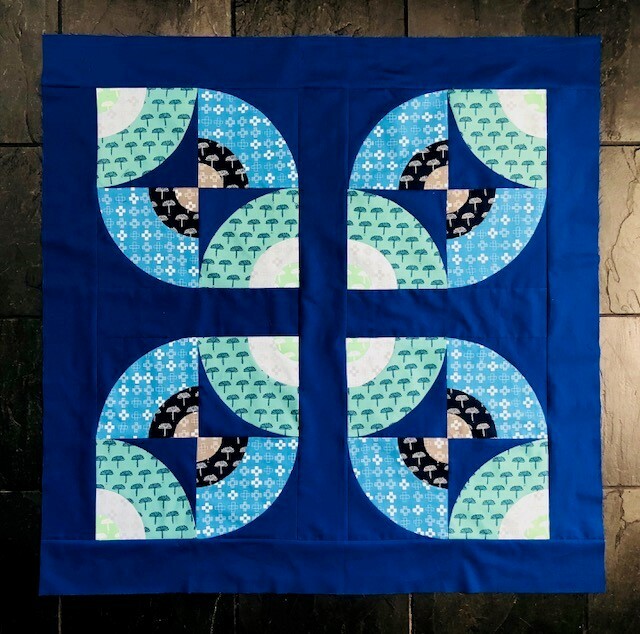 What a great initial quilt and then the subsequent versions are fantastic! Well done Gini I am sure this will be very popular. Loved making this. Thanks for creating the pattern. 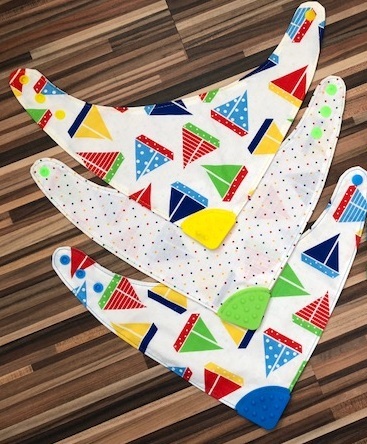 My great-niece recently gave birth to a beautiful baby boy, Edward, so writing a blog featuring a hand sewn baby item was perfect timing for me. I’m about to make some of these for my grandchild so I’m really pleased to have read your blog. I think I will be needing to buy the snaps as they look great. Love these kitties, could be very tempted by a pattern in spite of my stack of UFO’S. The mini quilt Gini received certainly echoes the colours she loves, beautifully made. Seeing your FMQ in close up its amazing. Looking forward to seeing the pattern too. I’m waiting with baited breath for your lovely pattern! I had so much lovely feedback from last month’s post that I thought I would share another technique that I really enjoy: appliqué. 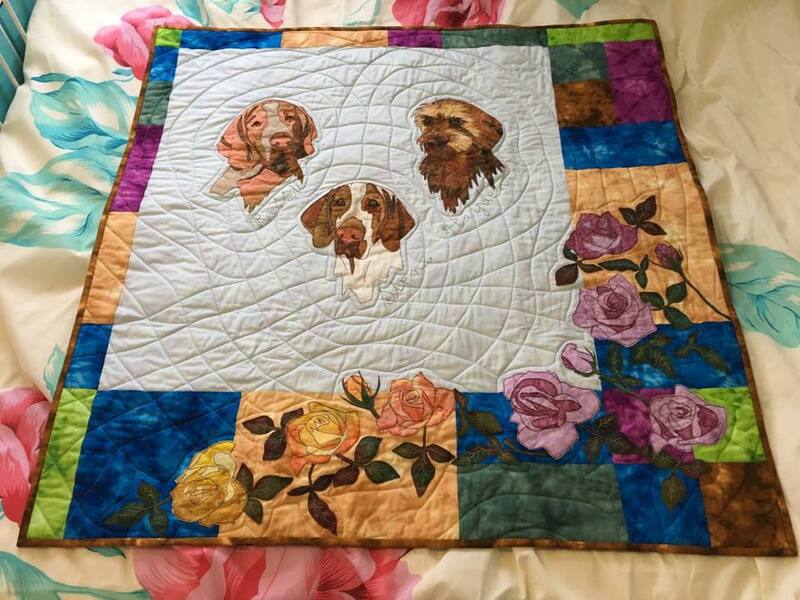 Lovely work, both the dogs and the roses look so lifelife. Thank you for showing them. 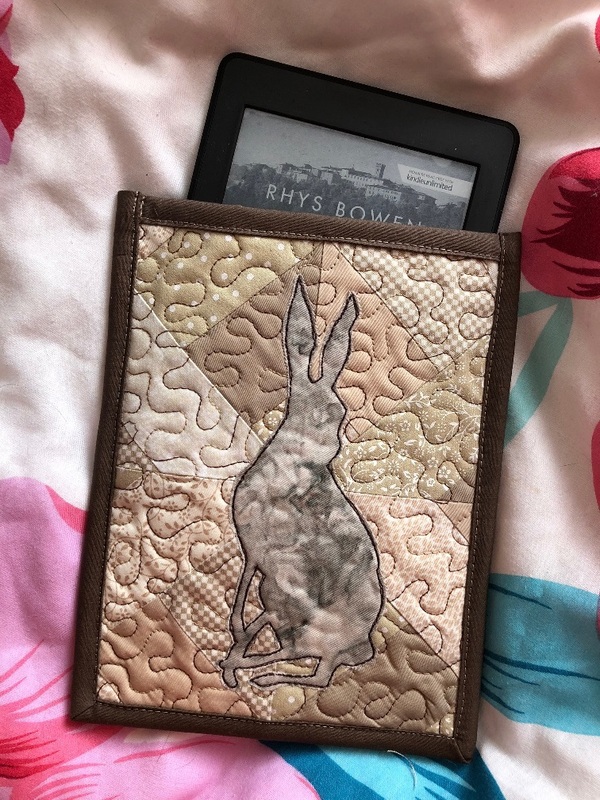 What a lovely read and a gorgeous quilt! Very informative about the dyeing process – wouldn’t have thought of shaking the granules over the fabric! and washing in salty water first – Brilliant!! 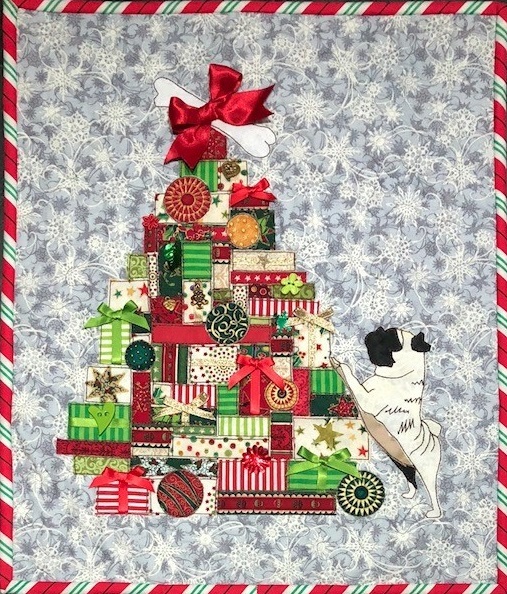 Looking forward the this years’ Quilt…..
That’s so true about never getting any quilty gifts. 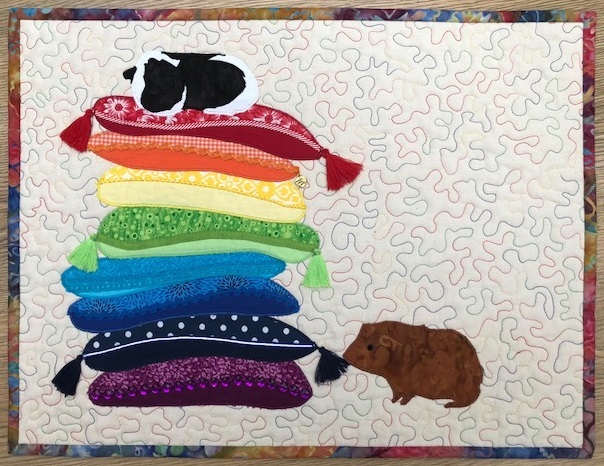 I did an FPP swap last year and was absolutely blown away when my quilt arrived.I have it in my sewing room and look at it every day.I have never tried dyeing but I do like your sprinklng technique…oh dear,another future project for ‘the list’. I hope the recipient of your quilt was thrillled with it! Lovely blog Gini, I really enjoyed it. 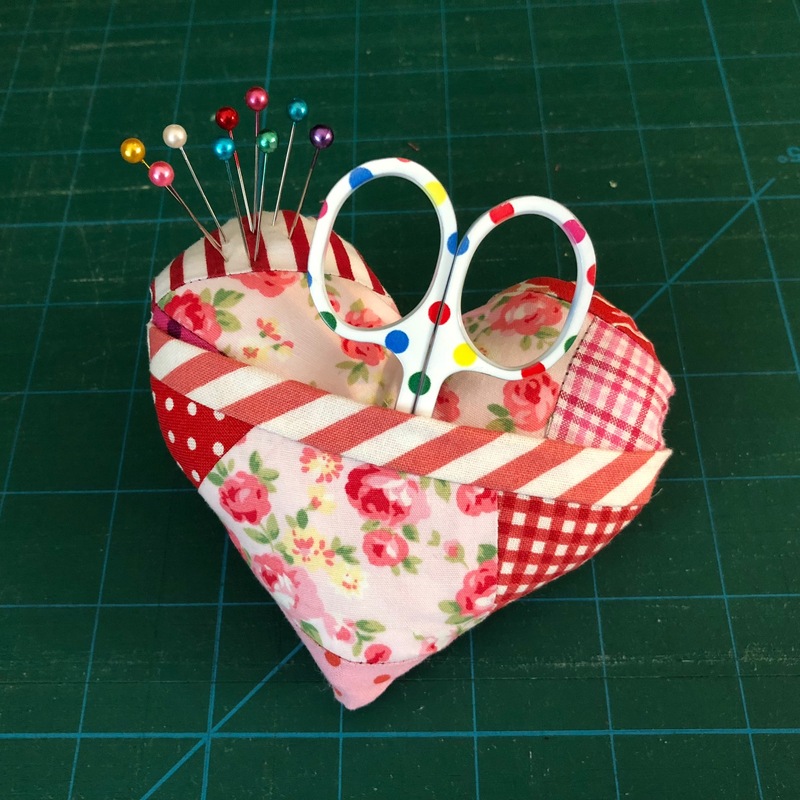 And your mini quilt is absolutely gorgeous – I would have been so pleased if I had been the one to receive this – beautiful! I loved the description of your technique for dying too, the speckled effect is great. When doing the ice or snow dying the results are somewhat unpredictable which can be part of the fun but can leave some bare areas. Your sprinkle method combined with ice dying seems like a good way to get the best of both worlds. 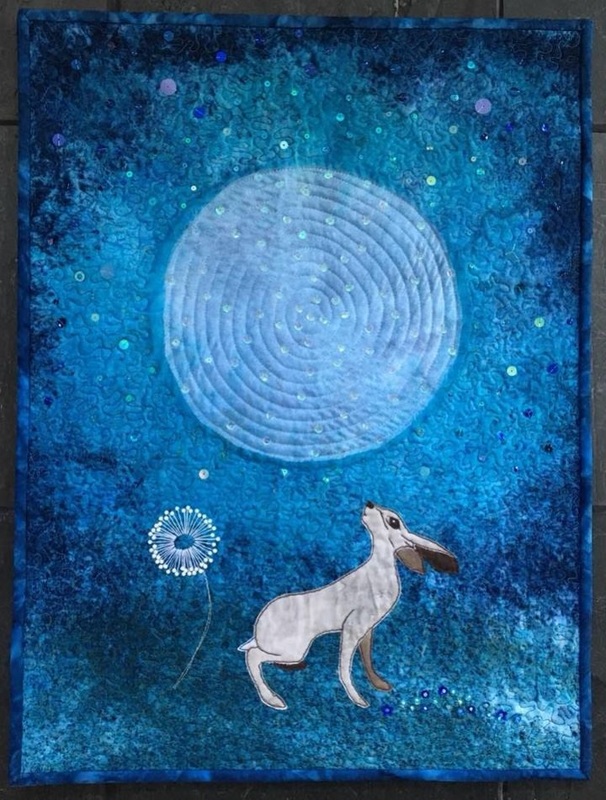 I remember seeing and liking that quilt when I saw it last year, but it is really lovely and quite inspiring seeing how you went about making it. Remember it from last years swap and loved it. That technique is interesting. Could it work with procion dyes I wonder? 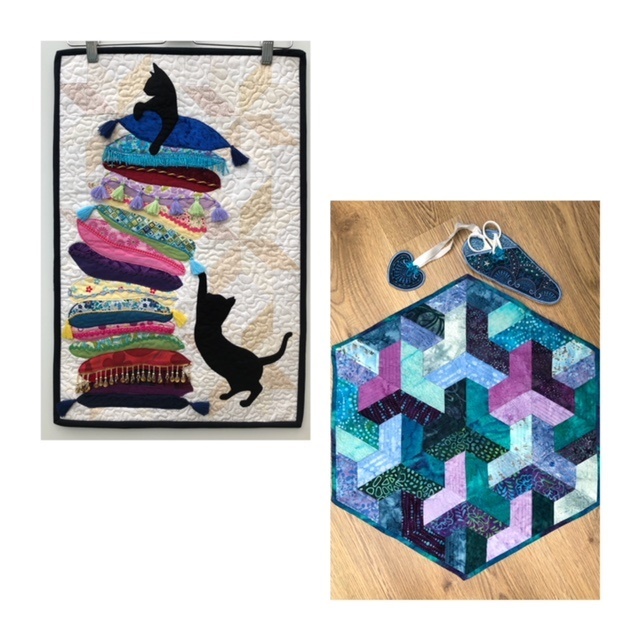 I have just completed my first mini quilt challenge. I really enjoyed the whole process. I wasn’t expecting all the lovely comments about it as i didnt think it was very good . The lady that received it was over the moon with it and said i couldn’t have got it more right for her. So anyone reading my comment, don’t think about doing it,get on and do it because life is short and we need to fill our lives with pleasure. I learnt so much along the way and im overwhelmed with the response i have had from it. Wow! 5 years? That’s incredible! 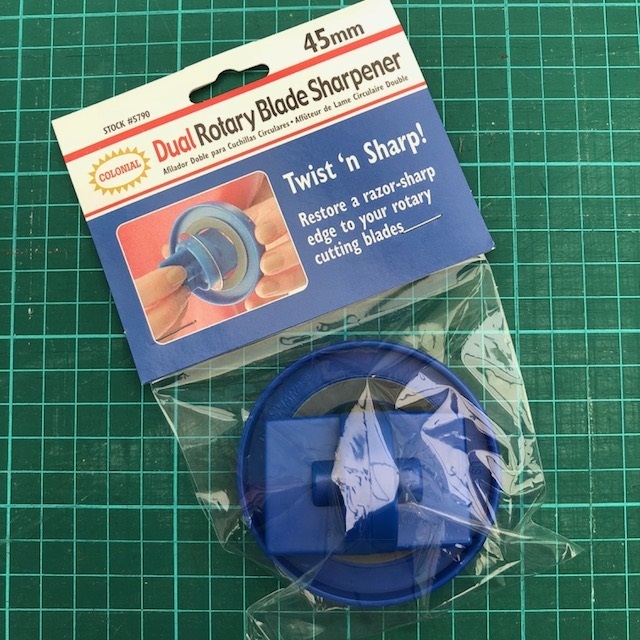 I’m lucky to make 5 months but I can really see this sharpener getting used a lot! I think this is now on my list of items I need to purchase. Thank you. What a lovely little project. I’m with you on scrap storing – I think it stems from my early playgroup leader days when we had to gather resources from everywhere and make the most of what we had (no money to buy things). I still ‘hoard’ to recycle now. Another thing to try – exciting.